Adapted by Jonathan Neeley. Image by bfishadow licensed under Creative Commons. 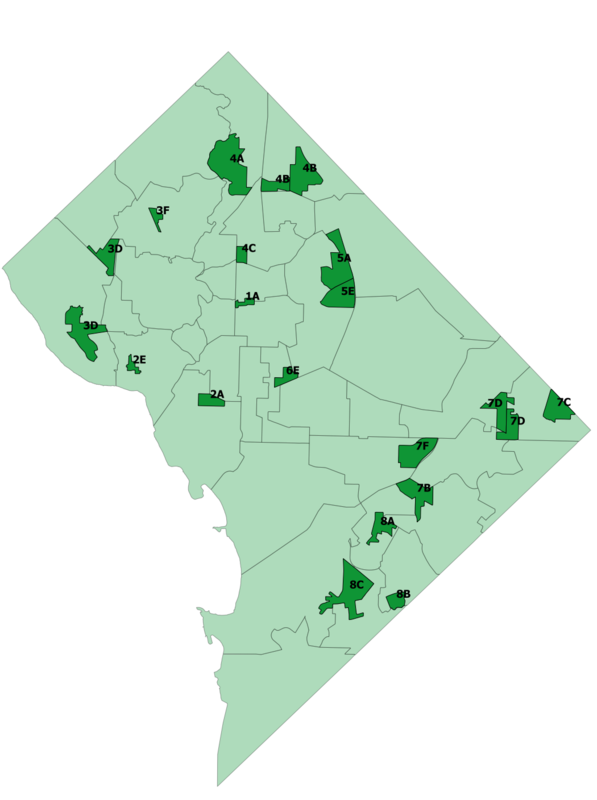 We’ve recently written a lot about candidates in Advisory Neighborhood Commission races all over DC. In 21 districts, no candidates filed petitions to get on the ballot, but people can run as write-in candidates. If you’re running, let us know! Or do you live in one of these empty districts? Consider running! DC has 40 Advisory Neighborhood Commissions that are split up into 296 single-member districts. Commissioners have expansive but often thankless responsibilities, and while the positions are unpaid, I know commissioners who spend anywhere from 10-20 hours a week on the work. But while being a commissioner is hard work, it’s also incredibly rewarding. Commissioners are leading the conversation in their neighborhoods on transportation, liquor licensing, and development. They really get to know their communities inside and out: the issues, the people, and the DC government. Talking to commissioners across the city is one of my favorite parts of working at GGWash. Talented and committed commissioners can tell you the stories behind each park, tree, building, and sign. Not sure which ANC/SMD you live in? Just type in your address into our interactive ANC Voter Guide. Serious write-in candidates have a really good chance to win these seats. In 2016, we made a similar call for write-in candidates and found eight great urbanists who ran last minute. Nearly all of them ended up winning. Sound like something you want to do? All you have to do is 1) be a registered voter, 2) you must have lived in your single member district (SMD) for at least 60 days, and 3) get a bunch of your neighbors to write in your name on November 6! Seriously, 50 people and you’ve probably won. If you’re running a write-in campaign, let us know! Our volunteer elections team has done a lot of work to make sure voters know the positions of ANC candidates all across the city. We want to make sure voters get the same chance to review as many write-in candidates as possible. If you’re running a write-in campaign for ANC this election, fill out our 2016 ANC candidate questionnaire by Friday, October 26. If you know of a candidate, please send this post to them. We will review responses from these candidates quickly and let you know if we found anyone we’d like to endorse before Election Day. This post has been updated with a map of where the vacant seats are located.